The number of customers using cryptocurrencies is on the rise. The cryptocurrency industry is now directly in the spotlight of government regulators, and global enforcement actions are trending up. Banks must ensure that their transaction-monitoring units are taking appropriate steps to identify U.S. dollar transactions involving cryptocurrency businesses. To help accomplish this, banks can apply traditional AML investigative principles, including understanding the relevant characteristics and aspects of the transacting parties and using that information to assess transaction risks. 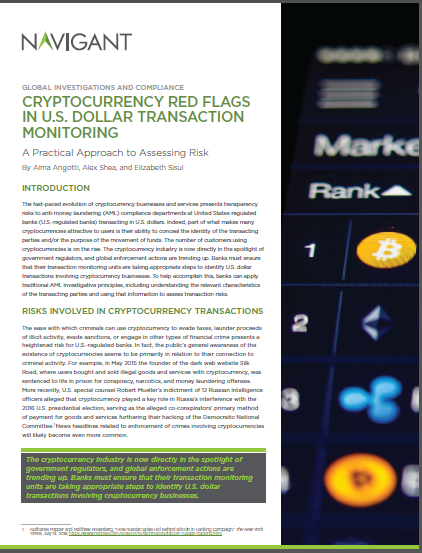 We offer a guide to aid U.S.-regulated banks in understanding and identifying transactions processed on behalf of cryptocurrency businesses and potentially suspicious and unlawful uses of cryptocurrencies (cryptocurrency red flags). With this understanding, banks will have a better grasp of their customers that may be involved in the cryptocurrency industry, which will enable them to properly monitor cryptocurrency-related activity and provide regulators with more meaningful reporting. The scope of this guidance is limited to U.S. dollar transactions because of the critical role U.S. dollars play in the global economy.